Before we dive in, I just have to share with you guys that Maggie is one of our very favorite humans in PF blogland. She will never tell you herself how awesome she is, but it’s true. I’m especially grateful for her friendship and support since our blogs were both baby blogs – and, of course, all the Clueless GIFs. So needless to say, I’m thrilled to be here. There is a constant battle between the process and the product in early retirement talk. Mr. T and I lean toward a calmer, more comfortable process leading to a delayed product of early retirement. Others choose to give up a lot more than we do in the process for a sooner product. Balance is important. If you ruin your health, happiness, or relationships along the way, you’ll find yourself retired early and alone and sick. But you are the only one that can determine what that balance looks like for you. It’s important to take another factor into consideration as well: Pride – The good kind. The kind where you roll up your sleeves, grab a cup of lemonade and just sit and stare thinking nothing but “I did that!” It’s a great feeling, right? I have had the same haircut forever (a simple, A-line bob if you really wanted to know). When I go to cut my hair, I think: “I’m going to do something different!” but then I go do the exact same thing. This is an example of status quo bias. We like things to be the same and any deviation from that point is considered a loss. What if I hate my hair? What if the guy who is running against the incumbent is going to be worse than that guy? What if I quit my job and regret it? It’s easier to stay the same. Flashback 12 years ago: I’m on a study abroad in London and the Vidal Sassoon Salon is offering free haircuts if you’re willing to get anything. YES! This is my chance to be crazy! I walk in. Every single person has crazy hair. My own guy has a tight Afro with ringlets hanging off of it like a disco ball. It was amazing. I wonder what I’ll get! Our three-week trip away from our children forced Mr. T and I to finally kick into gear and make a legal will (you know, because planes falling out of the sky are actually a thing these days!). We always knew we needed one, but it seemed so daunting! Well, guys, we did it. It is done. And now I’m here to help you through doing the same thing. Obviously, I’m no lawyer or financial advisor, so don’t go around thinking this is legal or financial advice. I’m just here to help you with the first step: thinking through most of the things you’ll need to consider before drafting your own will. Happy Friday! Today, Mr. T and I are in London. Tomorrow, we get to see the new play, Harry Potter and the Cursed Child (I’m really, really excited!). Also tomorrow, we get to witness the grand parade that is the Trooping of the Colour (in honor of the Queen’s 90th this year!). I hope your summer is going well. 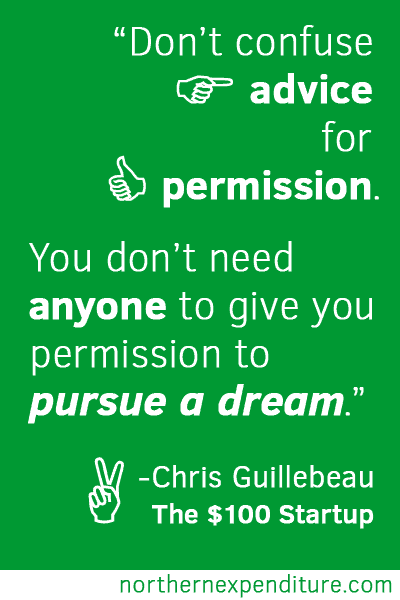 Today’s quote from Chris Guillebeau is one of my favorites from the $100 Startup. It’s so inspiring! If you want to do it, DO IT! Follow your dream. Make it happen. Tell the naysayers to get lost and go and live your dream! Have a great weekend, friends! Money is an interesting thing. While it is an amazing tool to help you reach your dreams, it is also the root of suicide, homicide, divorce, and family divisions. If you want to bring out the absolute worst in people, buy them a winning lottery ticket. It turns out winning the lottery is a horrible thing for most people. Money makes us crazy. Want to Save More? Plan for Regret.